African mythology is a big part of the makeup of Africa. The stories and myths passed down from generation to generation often reflect the beliefs and values of the people in question. Most African myths deal with themes like the origin of the world and what happens to an individual after death. Admittedly, these are things that people are always curious about so it is no wonder myths are used to explain them. Despite the fact that African mythology is often carefully preserved among African cultures, even becoming a meaningful part of people’s lives in rural areas, little has been done to introduce it to the wider world. Greek myths, for instance, do not have that problem. Their myths and gods have been included in various entertainment mediums like films or games that most people can name at least a few greek gods. African mythology has, however, never had such a place in fantasy realms…until now. Creative artist, Akdogan Ali, and programmer, Umusu Samson Iruo, have embarked on a journey to create a video game that will showcase Africa to the world. The game which now has a beta version is called Throne of gods. “Throne of gods is an epic fighting game based on African mythology, created by a pair of Africans, self-taught in Game development. 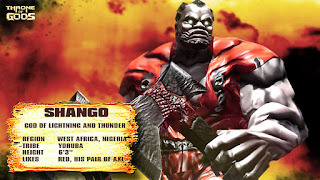 “Battle between African gods and goddesses on your android and IOS mobile devices. “We have a beta version released for test purpose with two playable characters.